Palestinian-born Syrian software engineer Bassel Khartabil is the winner of this year’s Index on Censorship Digital Freedom Award, sponsored by Google. Khartabil is a free internet pioneer who has spent his career advancing open source technologies. 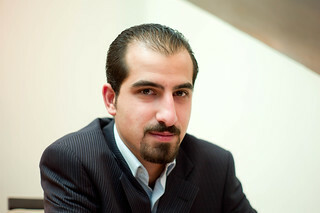 On March 15, 2012, he was illegally imprisoned in Syria. His family were given no official information about why or where he was detained but have since learnt that he is being held at the security branch of Kafer Sousa, Damascus. Bassel is known worldwide for his strong commitment to the open web, teaching others about technology, and contributing his experience freely to help the world. Bassel is the inventor of an open source software that powers the Open Clip Art Library. He is an original contributor to the Arabic Wikipedia and launched Creative Commons Syria. He is well known in online technical communities as a dedicated volunteer to major Internet projects like Creative Commons, Mozilla Firefox, Wikipedia, Open Clip Art Library, and Fabricatorz.